If you're like me, you began planning this year's Halloween costume the day after last year's Halloween! But how do you choose the perfect costume? There are so many cute choices out there so choosing the right costume is no easy task! The perfect costume has to be cute, fun, comfortable, and durable enough to last for a couple of hours of trick-or-treating. You might also want to consider whether it is warm enough for those cold Halloween nights we have here in New England! Here we've compiled a list of some of the cutest costumes that we've come across. We encourage you to purchase a costume EARLY. Don't make the mistake of waiting until the last few weeks of October when the stores are all sold out of the cutest costumes or the right sizes. We also encourage you to check out Amazon's enormous Kids Halloween collection, which tends to be about half the price of costumes in the Halloween stores (which can really get excessive for price), and has a much larger selection. Check out the Glowy Zoey video if you have a minute, it's a new and really awesome "stick figure" costume, which is a really great option for the entire family. Pretty expensive, but there are some other (cheaper) options on Amazon here. There are three categories below, first is for Infants costumes (0-1 year), second is for Toddler costumes (1-3 years), and third is for movie themed costumes (like some awesome Frozen costumes, Minion costumes, and Inside Out costumes). For older kids, check out these lists. Have a great Halloween! 1. 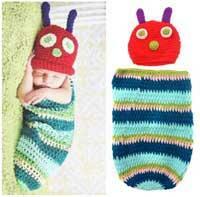 Foxnovo Caterpillar Style Baby Handmade Crochet Costume. Baby's first Halloween? No worries. We found the perfect costume! This adorable costume is handmade (crochet) and fits babies 3-9 months old. Put a onesie on underneath and your baby is ready for his/her first Halloween adventure. This costume is also great for newborn photoshoots. One thing to note, the stitching around the eyes is pink, not white as they appear in the picture. The look and feel of this costume is high quality due to its handmade crochet knitting, which gives it an authentic "like grandma makes" type of design and fit. It's also cuddly and warm for those cooler Halloween nights, and those antennae are ridiculously adorable. Click on the photo to the left to see more details and additional color and pattern options: in addition to caterpillar they have turtle, ladybug, mermaid, giraffe, and mouse. Some of them area really ridiculously cute. Get them know before they're sold out, definitely already low on inventory! 2. 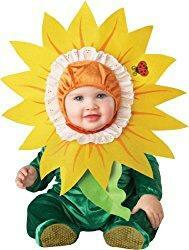 InCharacter Unisex-baby Infant Sunflower Costume. This sunflower costume is as cute, bright, and cheerful as they come! Let's leave the scary costumes for the older kids and show off just how adorable our babies are! This costume has a shiny green onesie bottom with skid-proof booties, and a large but lightweight yellow flower with an adorable little ladybug and leaf. Now that we've gotten all that cute stuff out of the way, here are some functional details. It is machine washable and has snaps for easy diaper changes, uses a great stretchy cap on the top to hold on the flower part, and seems to be pretty decent quality. Sizes range from 0-6 months to 18-24 months, but inventory is limited so we suggest buying long before Halloween sneaks up on you. We wish we had known about this costume for our kids when they were younger, it's a definite favorite! 3. Rubie's Costume Co. Baby Peas in a Pod Costume. We just love this cute peas in a pod costume, with its soft green fabric, little fluffball peas, and its warmth and comfort. It's a one-piece costume built a little like a sleeping blanket with an adorable little hood. This is the perfect costume for climates that might be getting a little chilly by the end of October, such as New England, the mid-west, and northwest. This costume is intended for babies 0-9 months, and we cannot seem to find it in any other sizes. Unlike the previous costume, this one is handwash only, so keep that in mind if you intend to re-use it for multiple Halloween parties this year. 1. InCharacter Elephant Costume. This costume is sure to be a winner. Of course, I'm biased. Our son wore this costume when he was 2 years old (and almost every day for the month after Halloween). This costume comes with detachable hood (with ears and trunk) and booties. It also has snaps for easy diaper changes. The cloth is super soft and comfortable, there are skid proof booties, and there's not much cuter than the giant ears and trunk! A nice added touch are the white paw pads on the ends of the sleeves and legs, and the little white tusks sticking off from the bottom. Prices on this one vary widely from about $35 for some sizes, to up to $80 for the XS (0-6 mo) size. 2. Sock Monkey Costume. Who doesn't love a sock monkey!? If you're looking for a cute and original costume, you should consider this one for your 12-18 month old; but do it fast because inventory is very limited and we suspect it will be sold out long before the first week of October. 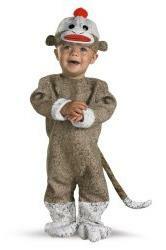 This jumpsuit comes with attached boot covers, a headpiece, and detachable tail. It has a nice soft fabric that is super comfortable, bright cheery red colors, and a rich-looking sheen to the brown monkey fur. 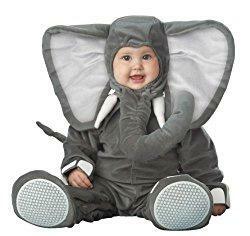 Similar to the elephant costume above, this costume has snap closure pants for easy diaper changes. We love the feature of having a removable tail, since sometimes little ones can get a little annoyed by it, trip over it, get it grabbed by other kids, or accidentally drag it through something yucky. 3. Rubie's Deluxe Baby Berry Cute Costume. This strawberry costume is so cute and we think it is going to be a big hit this season! There were a couple of these out trick-or-treating last year, and they were getting a ton of attention. The bright colors, cute stitching, and soft felt-like fabric are durable and comfortable. Like in the photo, we suggest combining it with black or white stockings for a cute color contrast that makes the red berry really pop. It is designed to fit 1-2 year old children. This costume comes with a berry tunic with a headpiece. The headpiece was soft and didn't have any rough edges near the velcro or around the face. The velcro on the bottom makes it easy to change diapers. The bright colors are super helpful if you're trick-or-treating after dark, your little one will stand out in the crowd! Minion Romper Gru Mask Adult Minion Costume!